Pabst is opening a 10bbl craft brewery? Craft beer writers and bloggers are drinking Miller High Life at their conference reception? Presentations on the science of tasting beer followed by an impassioned oral history of spontaneous lambic fermentation in Belgium? How about an outdoor lunch for the conference at a brewery that doesn’t exist yet? 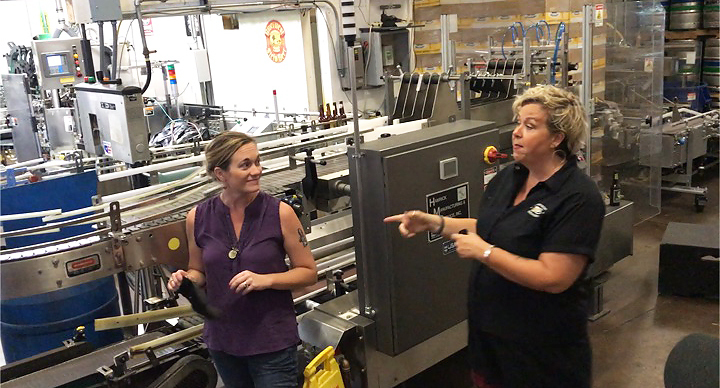 And why not sing the theme from Laverne and Shirley while trying to put a glove on a craft beer bottle as it goes down the bottling line at Lakefront Brewing? Milwaukee is indeed a city built on beer – they don’t call it “Brew City” for nothing – but in some ways it’s the current beer world culture turned upside down. 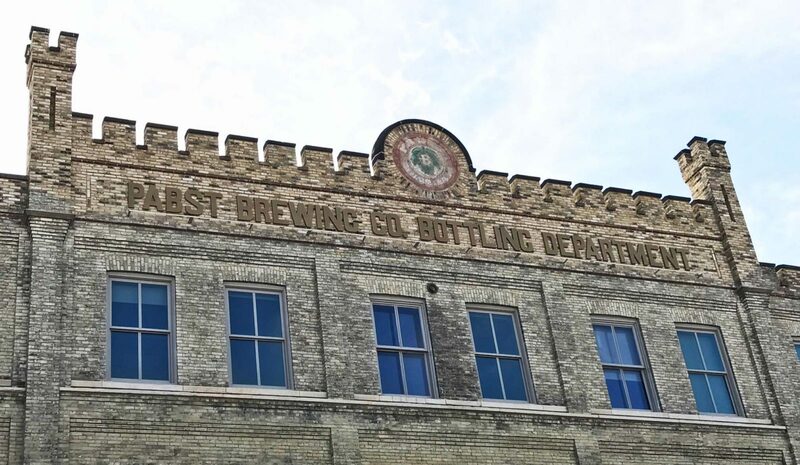 There are certainly a number of small craft breweries to be found in Milwaukee, but the heritage (some say the burden) of really big corporate beer still casts an usually long shadow over this town. Miller and Pabst (and the long departed Schlitz, Blatz and others) not long ago were the major employers in this midwestern metropolis, and their massive beer halls, brewery buildings, facilities and logos still dominate the landscape and mindset of the city. 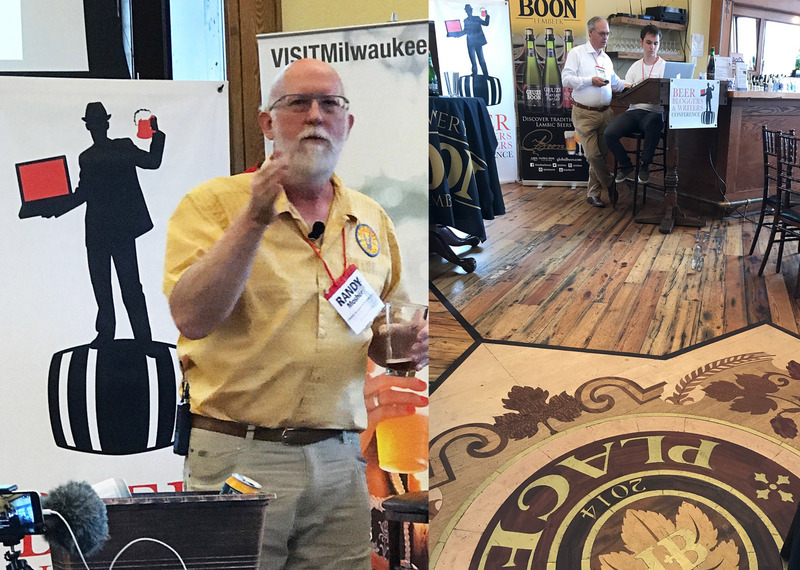 In early August the seventh annual Beer Bloggers & Writers Conference was held in Milwaukee, Wisconsin – “the good land”, “where the rivers meet”. 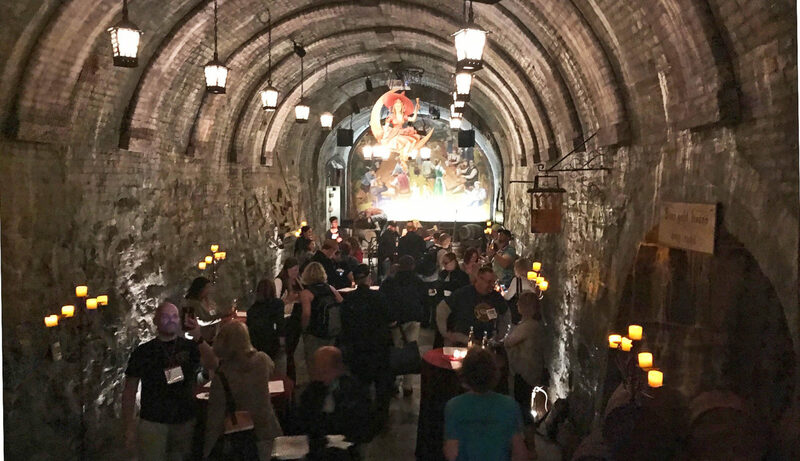 About 150 writers, industry representatives, bloggers and vendors got together to talk about the business, culture, the art and the history of beer. They talked about the past and the future of beer, and the trials and tribulations of selling their writing and leveraging social (and other) media for exposure. Ironically, one media expert told us: “exposure is good but you can also die of over exposure”. In the town, remnants of the old German culture are still evident – from the brats and lighter beer styles, to the beer halls and gardens. We were told that there are more outdoor beer festivals in Wisconsin than any state in the union – there are at least three each weekend in the summer. Local Sprecher Brewing – 33 years young – has outfitted decommissioned firetrucks and ambulances with beer taps to quench the thirst of the city’s park goers on demand. And Milwaukee is uniquely situated to support a culture of beer, and has been for more than 100 years. There is fresh water in abundance, and the city has been an industry and transportation hub since the 1800‘s. There is a vibrant dairy industry to support the stainless steel and plumbing infrastructure that is needed by the brewers. In the mid and late 1800’s German emigrants flocked together in Milwaukee, as they traveled as far west as they could by water through to the Great Lakes to live with other Germans already starting their new lives in America. Brewing is unquestionably a big part of the German culture, so setting up breweries in the US where they were settled only made sense. The Beer Bloggers Conference was held at “Best Place”, once part of the historic Pabst brewery in downtown’s gentrifying old brewery area. Named after the Capitan who once built Pabst into one of the largest breweries in the country, the beautifully restored old German style building is now decorated with brass, old wooden signs and neon PBR logos. Right next door is a public PBR tasting room and beer garden, and across the street the huge old beer packaging halls are being rebuilt into multifamily lofts and mixed retail. This conversion seemed symbolic of the old and the new world of beer running together. On the second day of the conference we all had lunch at a construction site which would eventually be a huge new “Milwaukee Brewing Co” craft beer palace. As we chomped on brats in the midwestern sun – we viewed illustrations that shared a vision of a future city block sized brewery/entertainment venue with open air dining and drinking, truly a modern version of the outdoor beer gardens of old. 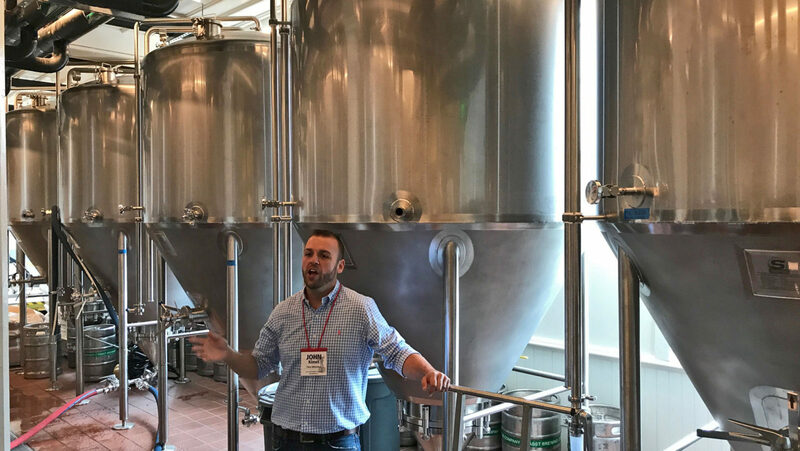 On the first day, conference attendees were herded up the street a couple of blocks to the “new Pabst Brewery” a 10bbl brewhouse specially constructed to fit inside a gothic church building. This “new/old” brewery is making some old recipes (“Old Tankard Ale”) and some new ones: “I am brewing a new squash beer recipe tomorrow for the GABF…and if it doesn’t work – we’ll just send it down the drain and learn from our mistakes” commented John Kimes, head brewer and tour guide. 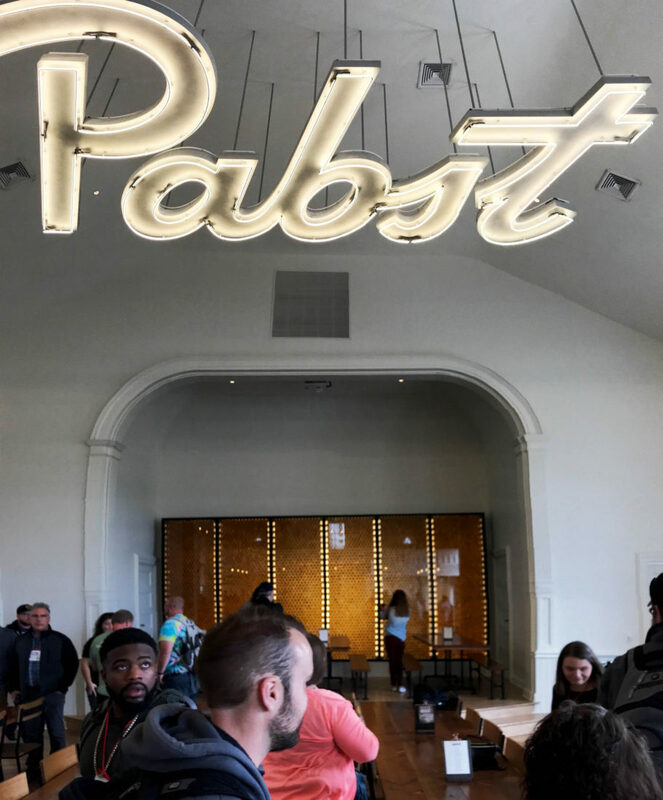 The place is positioned for beer tourists and to improve Pabst’s image, with some of the new brewery’s beer starting to show up at some local bars. It seemed ironic that John mentioned how eager he was for the new Milwaukee Brewing Company to be completed so he could “maybe borrow some storage space there”. Overall the conference was fun and interesting for brewing “insiders” and enthusiasts alike, though you were supposed to have an active beer related blog to attend. There were many interesting and useful presentations and sessions, but highlights in my view were: “Professionalize Your Blog” by Beer Advocate’s editor Ben Keene, “The Art of Spontaneous Fermentation” with Frank Boon of Brouwerij Boon (who flew in from Belgium for the event) and “Identifying and Describing Flavor, Smell, and Color” presented by Randy Mosher. The contrast between Randy’s thoroughly entertaining descriptions of the science of tasting beer (“Your mouth is full of bacteria that combines with and breaks down the flavor and aroma elements of beer – so don’t brush your teeth before a tasting”) and Frank Boon’s matter of a fact approach to the origins of wild beer from the 1400’s was eye opening. Frank patiently walked the conference attendees through the origination of the spontaneous brew we now know as “Belgian Lambic”. In 1400 (!) the beer was not even boiled, did not use any hops and used unmalted wheat to create a kind of “primitive weiss beer”. He described an early beer called “Keut” (pronounced “cut”) which means “short” in Dutch – referring to its short brew time. The malt was “wind dried” and it was not boiled. The problem with this beer was it’s extremely short drinkable lifespan before it turned to acid (vinegar). Frank quipped “They had a tough job, what they brewed they that day had to drink that day”. He later demonstrated the importance of pouring his beer in a dry glass using a spiral pour to help create the “two fingers of foam” that are a hallmark of the lambic style. After the sessions there was plenty of organized exploration of “Brew City’s” new and old breweries too. The first night the reception was held in the “Miller Beer Cave” – thoughtfully restored, leading to the brats and more beer at the “Miller Inn” next door. Seemed authentic, but it was hard to get over watching millennial beer geeks wandering around drinking macro lager “Miller Highlife”, “Lite” and “Hamms”. 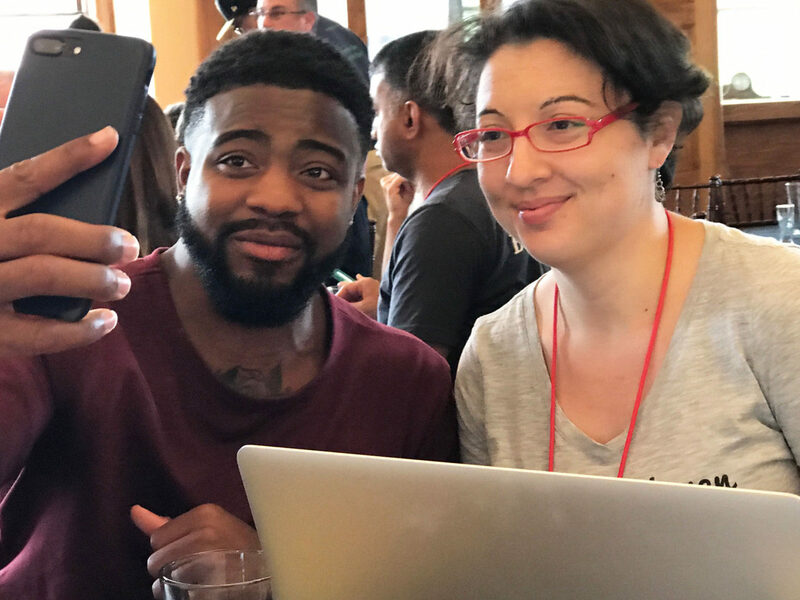 (Turns out MIllerCoors and Pabst are major sponsors of the Beer Blogger Conference, and their sponsorship in part keeps the conference fees surprisingly low.) It’s a constant reminder that Brew City is “Big Brewery City” as well. One local craft brewer described it as the “burden of the large traditional breweries on the new smaller breweries.” He explained that that shadow held back craft breweries for many years from reaching Milwaukee. I was frankly more comfortable at the smaller craft venues we visited like the new “Good Citizen” and the larger 25 year old Lakefront Brewing Co. Russ Kilsh, one of the founders and owners of Lakefront, attended the conference and later hosted guided tours of his brewhouse and entertained the attendees with his stories of early Milwaukee craft challenges. “In the 1970’s there were only about 75 breweries left in the country, but still 11 were here in Wisconsin. 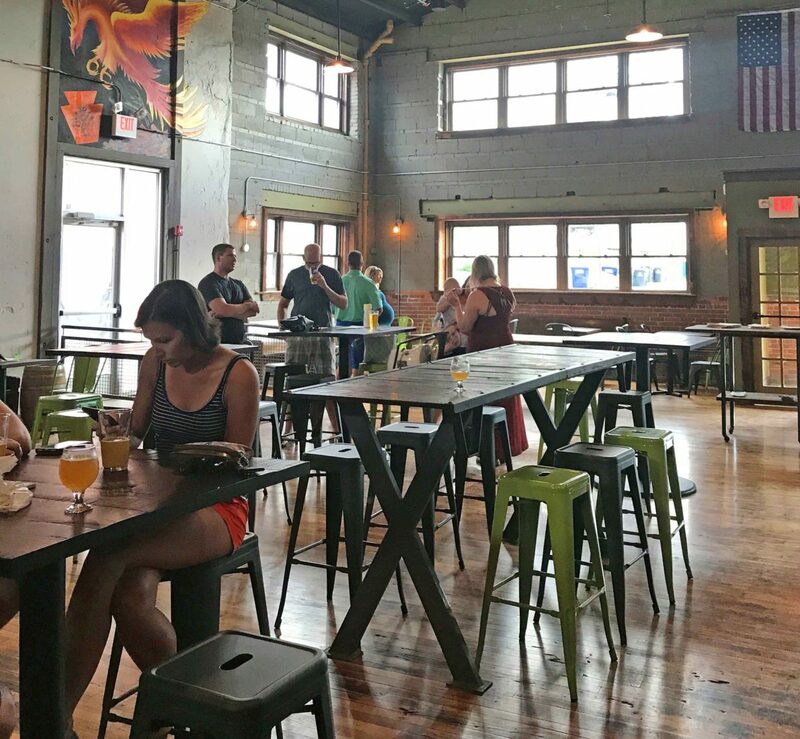 That delayed new breweries from starting up – and it’s not the best state for investors and capital, so you have to use your own money” he reflected. The new Brewers Association’s “Independently Owned” badge was affixed to the brewery door. 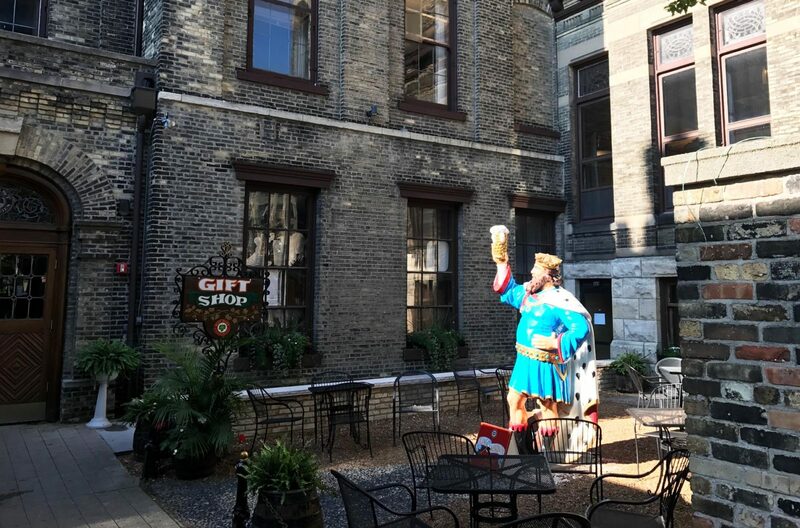 Milwaukee is indeed a fun town, and while the long shadow of it’s macro brewing past is pervasive and the PBR, Miller and Schlitz dominate signage at local watering holes, there’s now place for craft beer and their devotees as well. Young people drinking old beer, older people trying new beers. Old breweries restarting, old brewery buildings converted into homes for the Millennial’s, new beer gardens under construction. Why not visit the massive Harley Davidson museum, or hoist one at Ale Asylum while watching families kayaking down the Milwaukee River. Have a brat and your choice of craft or macro beer, and enjoy the past present and future of “Brew City” all at the same time.